To be served with Anna Olson's Warm Maple Chiffon Cake, or other cake of your choosing. 1. Whisk the icing sugar with 1 Tbsp of lemon juice, adding the remaining 1 Tbsp a little at a time to achieve the desired consistency. 2. Pour the glaze over the cake and serve or let set for 2 hours. 3. Makes about 1/2 cup. 1. Beat the cream cheese and butter until smooth. Beat in the icing sugar and then add the lemon zest and icing sugar. 2. Pipe or spread the frosting/filling as desired and chill. 3. Makes about 1 1/2 cups. 1. 1. Preheat the oven to 325 F and line a baking tray with parchment paper. 2. 2. Whip the egg white (by hand) until foamy and then stir in the sugar, whipping until the whites hold a soft peak. Stir in the vanilla. Add the almonds to coat them with the egg whites mixture and spread this onto the prepared baking tray. Bake the almonds for about 25 minutes, until golden brown. Cool completely before cracking the almonds into pieces to use as a garnish, and store in an airtight container. 3. The candied almonds will keep up to a week in an airtight container. 4. Makes 1 ½ cups. 1. 1. Place the chopped chocolate in a bowl with the butter and corn syrup. 2. 2. Heat the cream to just below a simmer and then pour it directly over the chopped chocolate. Let this sit for a minute. 3. 3. Using a spatula, stir the mixture until the chocolate has melted into the cream. The glaze will keep, refrigerated, for as long as the expiry date on the cream, and can be reheated to use. 4. 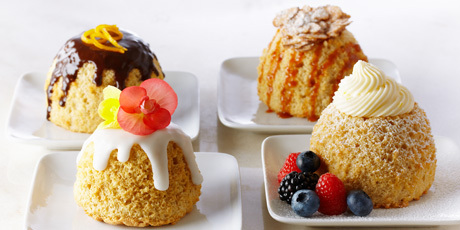 To serve, pour the warm chocolate glaze over the chiffon cakes and top with a few pieces of candied orange peel. 5. Makes about 3/4 cup.